It’s a very common occurrence. Your car is quietly sitting in its space at the mall parking lot when another vehicle pulls up and parks in the empty slot beside it. And then it happens – the other driver hurriedly opens his door and accidentally hits the side of your car. To a car owner, dents are rather inevitable. Even if you make every effort to safeguard your vehicle, accidents do happen. Dents can be quite irritating because they spoil an otherwise great looking automobile. 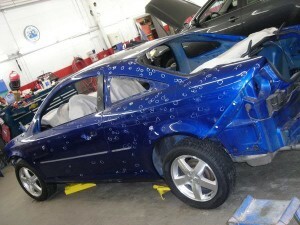 Too many dents may also reduce the resale value of your vehicle. If you’re bothered by dents on your vehicle’s exterior, then inquire about Jordan Automotive’s body repair services for the paintless dent removal Chicago motorists most prefer. Jordan Automotive has both the knowledge and experience, having been in the business of automotive repair for more than 20 years. For the paintless dent removal Chicago car enthusiasts are happy to recommend to other car enthusiasts, call Jordan Automotive at (773) 395-8888.